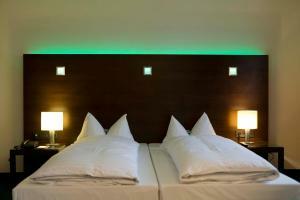 This hotel is located in the Schwabing district of Munich, just 300 metres from Münchner Freiheit Underground Station. It offers a hearty breakfast buffet, air-conditioned rooms and a fitness area. Guests at the Fleming’s Hotel München-Schwabing are welcome to relax in the sauna, steam room and gym. Fleming’s Brasserie and Wine Bar is an elegant restaurant serving grilled cuisine and seafood dishes. In summer months, drinks and meals can be enjoyed in the traditional beer garden. All of the Fleming’s modern rooms feature air conditioning and free Wi-Fi. Soundproofed windows ensure a quiet stay. The pretty Englischer Garten park is a 10-minute walk away, and the historic Marienplatz Square can be reached in 8 minutes by underground.